Although this spring was a disappointing one for morels in my area, the past week’s mushroom haul has more than made up for it. One of the tastiest mushrooms in season now is the Oyster Mushroom. You can hunt for this common variety of mushroom from spring through fall (and even during warm, wet spells during the winter). If mushroom hunting isn’t your thing, you can look for cultivated varieties at farmers markets or Asian markets. You can also grow your own oyster mushrooms at home using kits. 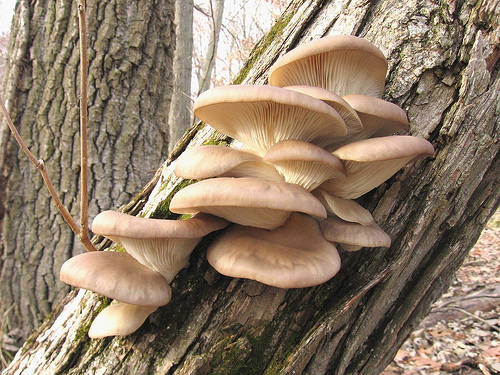 Oyster mushrooms can be found on living and dead tree trunks and logs. They are fairly easy to identify, but be wary of look-alikes such as the orange mock oyster and bear lentinus. These look-alikes are not dangerous, but may be woody or unpleasant-tasting. As with all foraging, the safest way to learn how to find oyster mushrooms is to go hunting with an expert before heading out on your own. Oyster mushrooms have a chewy texture and a delicate, sweet flavor. Use them in any recipe that calls for “wild mushrooms,” such as these vegan roasted wild mushroom tacos. I chose to saute my oyster mushrooms in olive oil with garlic, spring onions, chili flakes, and the first patty pan squash of the season. Delicious! Image courtesy of a.bower via a Creative Commons license. If you are interested in an eco-friendly, 100% sustainable grow-at-home mushroom kit, check out http://www.bttrventures.com. Nikhil Arora and Alex Velez, two Berkeley grads, recently started BTTR Ventures, an urban mushroom farm that converts literally TONS of coffee bean waste into mushrooms. They just launched these grow-at-home kits that use the same waste products. Check them out and let us know what you think! Oyster mushrooms are certainly up there with the top mushroom favorites. They are one of the easiest shrooms to find without having to compromise with the taste. Pingback:Hunting for Wild Chicken Mushrooms : Eat. Drink. Better.